Please read Part 1 of this sad story to fully grasp the significance of the attached report. Nashville, TN–After an unclear series of tragic events, Leroy “Tree” Brown–family Christmas tree of Suburban Diva–took its own life in the early hours of December 3rd, sources confirm today. While not described as “beloved,” (berated, beguiled and belittled perhaps) the tree was a short-lived resident of the Diva home. Neighbors say they assumed it had arrived the previous weekend when the family returned from an outing in a flurry of pine needles and some sort of flying insect mass. That was the last they heard from the family until authorities arrived Tuesday. Mrs. Kravitz went on to explain the events of that fateful night. Go home, Tree, you’re drunk. Authorities confirm that suicide was the apparent cause of death, but defensive wounds on Mrs. Diva, their children and dog were noted in the police report. 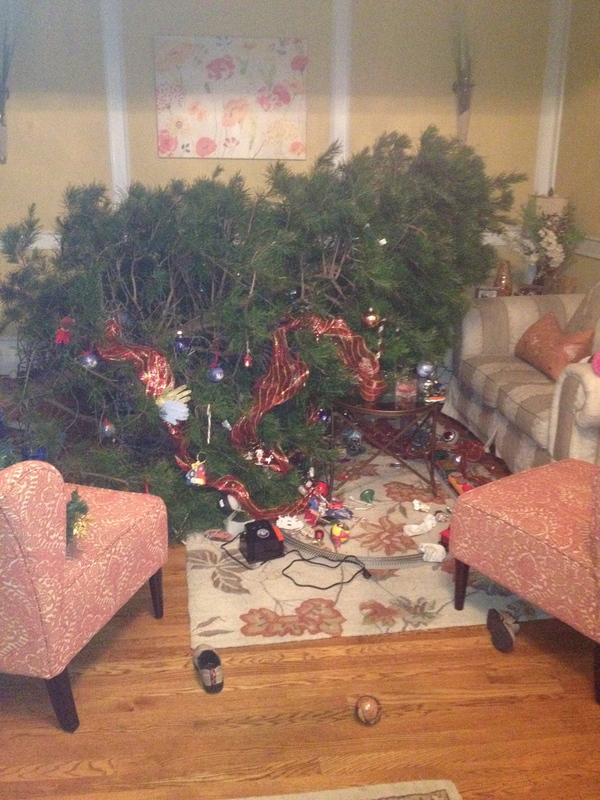 The tree stand also met its demise in the incident, but has been exonerated. No charges are expected with the exception of a Visa bill for the purchase of a replacement tree, six strands of multi-colored lights, and a dozen or so new ornaments. Unfortunately, an autopsy was not performed before the wood chipper dealt with the remains. They were scattered in a bed of pansies on consecrated ground, property records show. Private funeral services were already held in the driveway–a sort of “happy dance” and a ritualistic house cleansing performed by a shaman of unknown origin. A family spokesperson said in lieu of flowers, donations could be made to the Terminex trust fund and a nice bottle of Scotch for the Kravitz’. I think this case should be reopened under suspicion of topiary homicide.